Fusing the chic style and subtle seductions of the iconic South Beach brand with the vibrant energy of the Las Vegas Strip, Delano Las Vegas, the non-smoking, all-suite luxury hotel located adjacent to Mandalay Bay, defies every Las Vegas cliché. Anchored by dynamic public spaces and sophisticated accommodations, this modern luxury hotel provides an intimate experience and appeals to the most discerning travelers from around the globe. 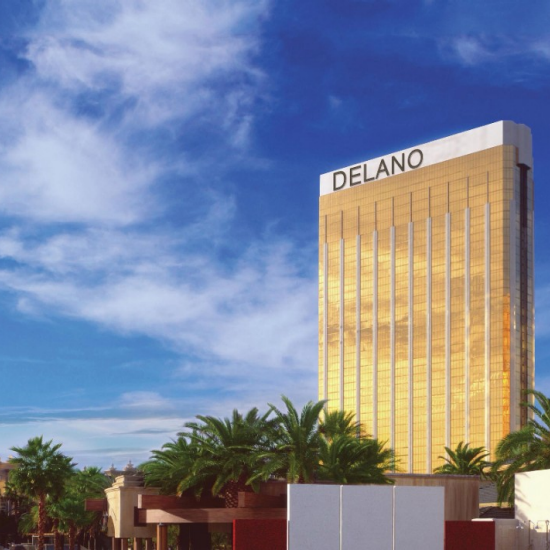 At Delano Las Vegas, guests can discover a blend of personalized service and effortless luxury coupled with unexpected elements of individuality and high-concept design. Please click the name of the department you would like to reach for more information. Please note that our staff responds to e-mail inquiries from 8:00 a.m. - 4:00 p.m. Monday-Friday PST (excluding holidays). Allow 3 to 4 business days for a response during normal business hours. Stay on Frank Sinatra Dr. Merge to Frank Sinatra Dr. Unfortunately, no seats are available. Please select another time or call 877.632.5400. Get Directions 3940 S Las Vegas Blvd.